Presbyopia is the age-associated progressive loss of the focusing power of the lens, resulting in difficulty seeing objects close to the eye. The focusing power of the eye, which depends upon the inherent elasticity of the lens, is gradually lost with the aging process. This results in a gradual decrease in the ability of the eye to focus on objects that are close up. It is usually noticed around the age of 45, when you realize that you need to hold reading materials further away in order to focus on them. 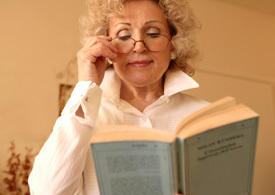 Presbyopia occurs progressively in everyone during the aging process.